This is a sample olefin fiber from the sample-set provided by Textile Fabric Consultants, Inc. Nouvelle is a trademarked product of the Hercules Company. Olefin fiber is a polymer fiber with a high proportion of double-bonded carbon in the backbone of the polymer. It is also known as polypropylene, polyethylene, or polyolefin fiber. It is formed into a fiber by extruding the heated polymer through a spinneret. This results in the fiber taking the cross-section of the spinneret. Olefin fiber can be round or any other desirable extruded shape. 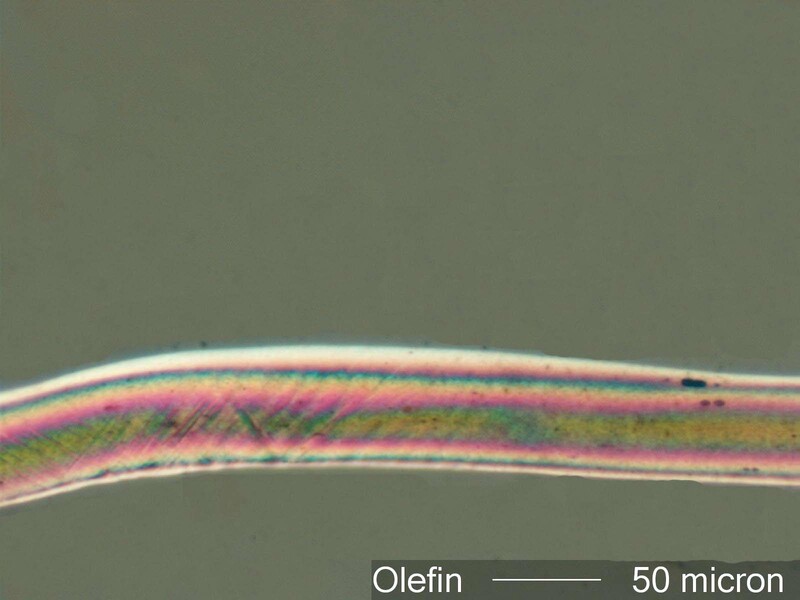 Olefin fiber has a refractive index along its length of about 1.56 and perpendicular to its length of about 1.51. It has a birefringence of about 0.05 and a positive sign of elongation. It tends to exhibit a smooth, regular surface along its length depending on its cross-section of the fiber.